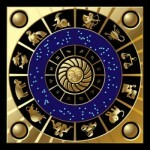 All Scorpios: look away now! Having just emerged almost brain dead but triumphant from a serious bout of deadline-itis, I am finding that the remaining braincell is rebelling at my attempts to cudgel some new inspiration therefrom. So, just to reassure my readers that I haven’t resigned from regular blog posting whilst I take a couple of weeks’ break, here is something which should amuse most of you – even the Scorpios. 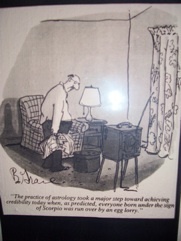 This lugubrious chap clutching a newspaper is staring at his television which is saying: ”The practice of astrology took a major step toward achieving credibility today when, as predicted, everyone born under the sign of Scorpio was run over by an egg truck”. 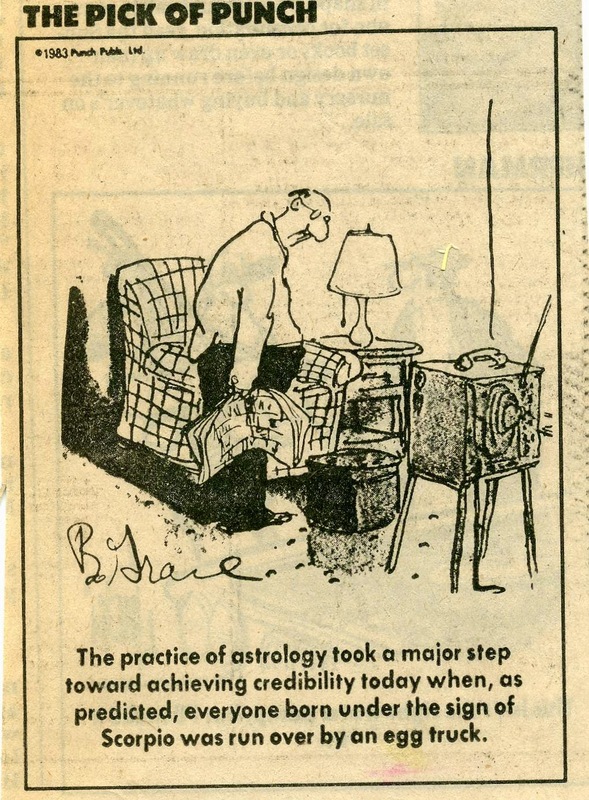 This lugubrious chap clutching a newspaper is staring at his television which is saying: ”The practice of astrology took a major step toward achieving credibility today when, as predicted, everyone born under the sign of Scorpio was run over by an egg lorry”.